The passenger ship "Carelia" with tourists on board was contacted by the "Kelt" in the Saimaa Canal in the so-called Vyborg Sea Canal leg on May 27, 2016. The passenger vessel was heading for Vyborg, while the "Kelt" was moving towards the Baltic Sea, en route from Siilinjarvi to Landskrona. Both vessels had Russian pilots on board. While the "Kelt" was trying to overtake the "Carelia" at a reduced speed, the cargo ship did not reduce the speed, and the sucking effect pulled her port side bow towards the "Carelia"'s starboard side. The vessels remained stuck to each other for about three minutes. No injures were reported, but both vessels suffered dents and scratches. The "Carelia" berthed in the port of Lappeenranta. 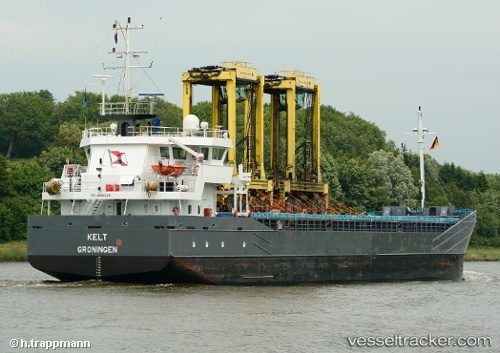 The "Kelt" was disabled after an engine falure in the night from Feb 8 to 9, 2015, enroute from Newport, UK, to Szczecin, in the Northsea. The ship was drifting towards the offshore wind farm Riffgat off Borkum. The patrol boat "Borkum" which was by chance nearby was dispatched by the Ems traffic control on Feb 9 at 6 a.m. and took the casualty in tow at 7.25 a.m. It held the ship in Position until the emergency tug "Nordic" which had been alerted too arrived at 8.30 a.m. From Delfzijl the tugs "Waterman“ and "Waterstroom" were sent in order to tow the ship to Delfzijl in the run of the day.